The Following presentation of images and text are brought to you by Keith Pashina and Kevin Musser, with a lot of help from Larry Wright. These images are from the Keith Pashina Collection and are copyright in the same way as other material located on this site (for personal use only, without consent). The original color slides were taken by Charles Sincock on the dates shown. The slides were scanned using a slide scanner. The color was corrected due to the poor condition of the color of these slides. They have been reproduced and enhanced here by the best Mac (I should say Larry) around. 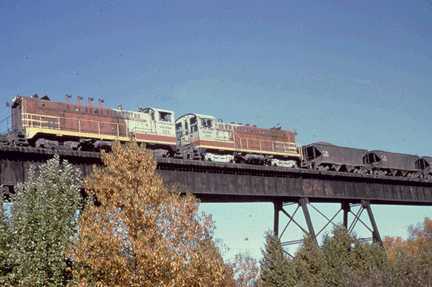 Copper Range 100 and 101 crossing bridge 41 between Beacon Hill and Edgemere with a rock train. Bridge 41 was 441 feet long and was built in 1906. One-third of the bridge was owned by the Copper Range Railroad the other two-thirds was owned by the Copper Range Company, who's mill was located at Freda. Bridge 41 was removed in the 1970's. 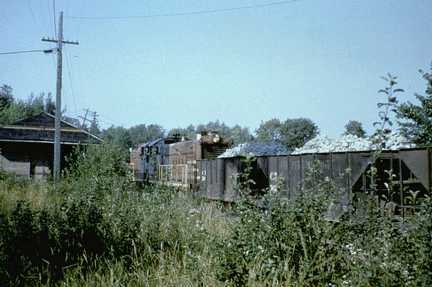 This train was one of the last rock trains on the Copper Range as Champion #4 in Painesdale closed in September of 1967. Rock was still shipped to the mill in Freda until November and the big freeze. This photo was taken in October of 1967. 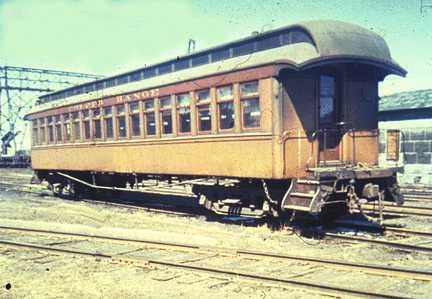 This is my favorite of all the slides, as I have been waiting a long time to see any of these passenger cars in color. Number 60 seen here in April 1962, 3 years before being shipped to the Marquette and Huron Mountain. Sold two years later to the Keweenaw Central (tourist version). It had not seen any action since the end of war-time passenger service from 1944-1946. For more detail on #60 go here. 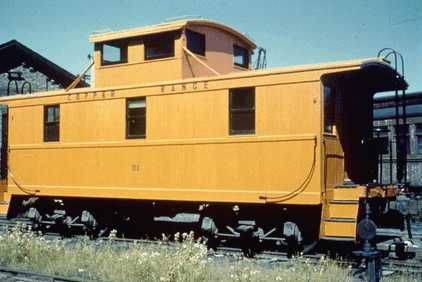 Copper Range Caboose #1, built by Russell in 1917, in her yellow paint scheme. This picture was taken in August of 1962 in the Houghton Yard. 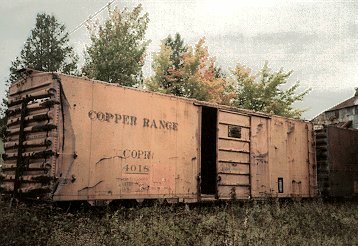 This caboose was sold in 1972 and became a spare bedroom in Gay, Mi. Althought this is not the best photo in the world it is significant as this is the last rock train from the Champion Mine. The train is crossing Chassell road just north of #4 shaft. The Painesdale depot is shown on the left. The photo was taken on the 6th of September in 1967. Copper Range Engine #29. 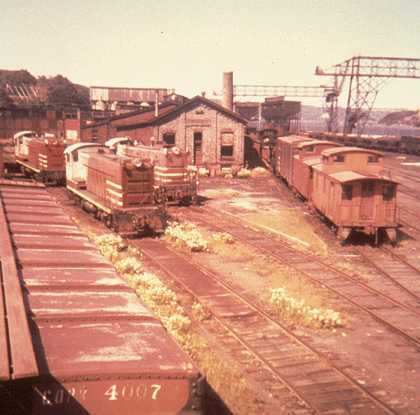 This, the most famous of all the Copper Range engines is caught here in the Houghton Yard in 1963, only four years before being sold to the Keweenaw Central Tourist line. The gentlemen on the gangway is none other than Charles Sincock, the man responsible for taking all of these color photos. Here is a photo of #29 running on the Keweenaw Central tourist line. And here is one of her now. Click here for the engine data. 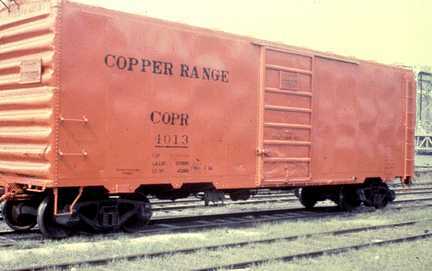 Copper Range work train. 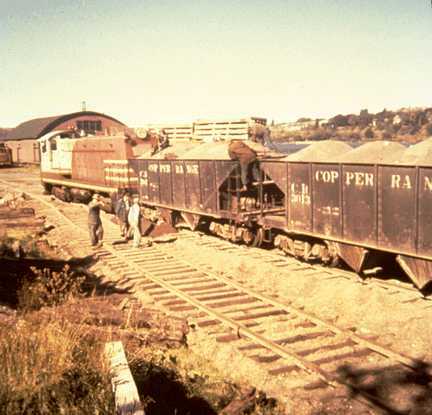 This photo shows one of the Copper Range engines hauling a trainload of stamp sand. The stamp sand is being used as ballast to raise the level of the tracks approaching the Portage bridge. Stamp sand was used quite often as ballast. This photo was taken in October of 1959. The Copper Range Freight house in the background burned three years after this photo was taken. Copper Range Diesel fleet, Even though Mr. Sincock was standing on a box car roof to take this photo he would have had no concern that the cars might start moving. This photo was taken during the Copper Range strike of 1961, which lasted from the 11th of July to the 2nd of September. On this spot today stands new homes and a waterfront park, ugh. P.S. The Copper Range depot begins it's third life this week as a doctors office. At least a little better than a Bonanza. A: Camouflaged so as not to be detected by on coming trains. B: They really think these are deer. 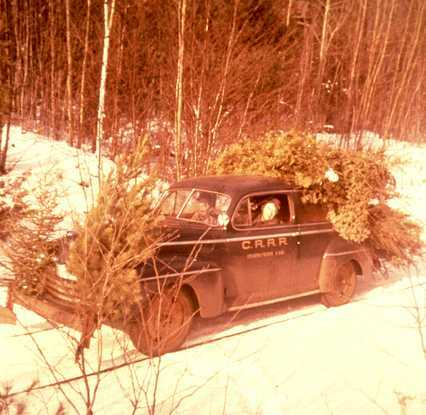 C: Collecting Christmas trees early, as this picture was taken on the 9th of November in 1961. Made from a '46 Ford, operators (jokesters) unknown. 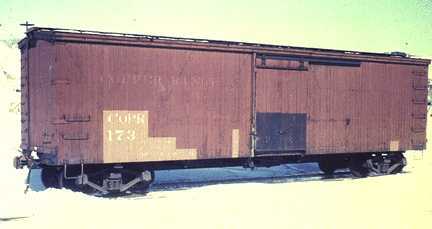 Built in 1912, COPR #173 was of wood construction with a steel underframe. 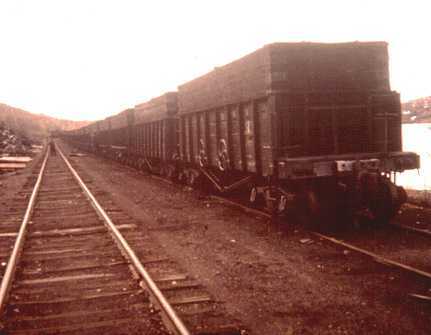 The first lot of 10 cars with steel underframes on the railroad. This photo was taken in April 1963 after the color shift to orange. I guess this car wasn't worth the cost of the paint in 1963. Wouldn't this make a great model, who says you can't model wood cars in the 60's. 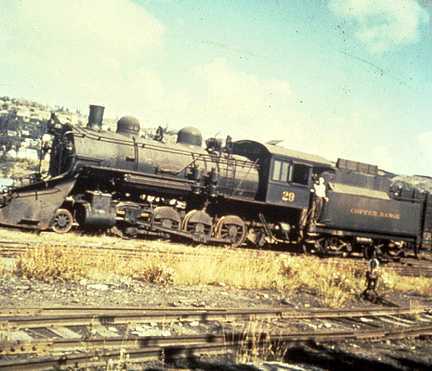 Built in 1903 as a lot of 52 cars (2196-2304) they are seen here on their death bed waiting to be scrapped in October 1961. The high side addition was added to carry coal later in life. These additions were made from other scrapped rock car bodies. This is a sad ending to our Color Photos of the Copper Range series, like the demise of the Copper Range itself. Part II of this series.